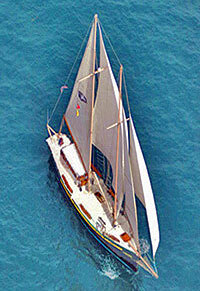 The Patricia Belle is a beautiful 82' schooner, brand new to Mazatlan. Fresh from the famous Baja Ha-Ha sailing tournament, she is primed and ready to take you sailing on the amazing waters of Mazatlan! Feel the serenity of sailing (wind conditions permitting), and enjoy panoramic views of Mazatlan and it's three islands - Wolf Island, Goat Island, and Deer Island. This is a relaxing day in the beautiful sunshine of Mazatlan, sailing on the high seas, enjoying the ambience, views, and fun times with the captain and crew. You'll get lots of great photo opportunities along the way, as you soak up the sun! Sail close to Mazatlan's three famous islands! Enjoy Lunch on the boat as you set sail again, soaking up the afternoon sun while you cruise with the wind back to port. The Patricia Belle is a relaxing, sailing tour - if you're looking for a booze cruise party boat, this isn't it. If you're looking for a lovely day of sailing in Mazatlan, you've found your home. Kids: All ages welcome. Kids 12 years old and under are kids price.